The new hotness these days is in manufacturers confirming that their Honeycomb tablets will be getting the Ice Cream Sandwich treatment, and get it fast. Word has it that the Motorola XOOM will get the Android 4.0 update, and it looks like the Acer ICONIA TAB A100 and A500 will be getting the update in very early 2012. 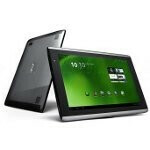 Apparently, word leaked from Acer Poland that the ICONIA TAB A100/101 and A500/501 would not be getting the update this year, but users should expect the ICS treatment in mid-January 2012. This seems to match up with a lot of the other update announcements that we've heard from other companies, so although there has been no official announcement, there is also no reason to be skeptical. Acer has been quick with updates in the past, so it seems reasonable that it would be able to get this one out fairly soon as well. will Galaxy Tab 101. get ICS?